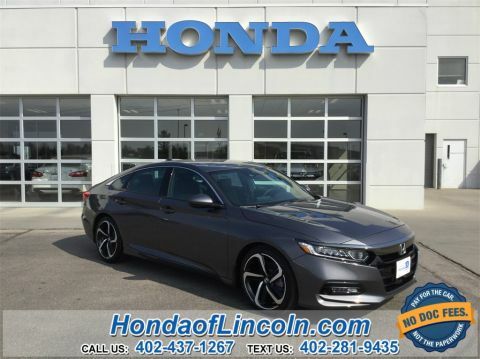 2018 Honda Accord Sport FWD 1.5T I4 DOHC 16V Turbocharged VTEC 6-Speed Manual, Black w/Cloth Seat Trim, Automatic temperature control, Distance pacing cruise control: Adaptive Cruise Control with Low-Speed Follow, Exterior Parking Camera Rear, Fully automatic headlights, Low tire pressure warning, Power driver seat, Radio: 180-Watt AM/FM Audio System, Steering wheel mounted audio controls, Wheels: 19" Machine-Finished Alloy w/Black Inserts. Discover the difference. Experience the value. Honda of Lincoln. 2018 Honda Accord Touring FWD 1.5T I4 DOHC 16V Turbocharged VTEC Ivory w/Leather-Trimmed Seats, Adaptive suspension, Blind spot sensor: Blind Spot Information (BSI) System warning, Exterior Parking Camera Rear, Heads-Up Display, Heated front seats, Heated rear seats, Memory seat, Navigation System, Power driver seat, Power moonroof, Steering wheel mounted audio controls, Wheels: 19" Machine-Finished Alloy w/Gray Inserts. Discover the difference. Experience the value. Honda of Lincoln. 2018 Honda Accord Touring FWD I4 DOHC 16V Turbocharged Ivory w/Leather-Trimmed Seats, Adaptive suspension, Automatic temperature control, Blind spot sensor: Blind Spot Information (BSI) System warning, Exterior Parking Camera Rear, Fully automatic headlights, Garage door transmitter: HomeLink, Heads-Up Display, Heated & Ventilated Front Bucket Seats, Heated rear seats, Memory seat, Navigation System, Power driver seat, Power moonroof, Radio: 450-Watt AM/FM/HD Premium Audio System, Steering wheel mounted audio controls, Wheels: 19" Machine-Finished Alloy w/Gray Inserts. Discover the difference. Experience the value. Honda of Lincoln. 2018 Honda Civic EX FWD 1.5L I4 DOHC 16V Black w/ Cloth Seat Trim, Alloy wheels, Automatic temperature control, Exterior Parking Camera Rear, Fully automatic headlights, Low tire pressure warning, Power moonroof, Radio: 180-Watt AM/FM/HD/SiriusXM Audio System, Steering wheel mounted audio controls. Discover the difference. Experience the value. Honda of Lincoln. April 19, 2019 - April 30, 2019. Special APR offer valid on new and unregistered 2018 Civic Sedan Models from April 19, 2019 through April 30, 2019, to well qualified buyers on approved credit by Honda Financial Services through participating dealers. Must take new retail delivery on vehicle from dealer stock by April 30, 2019. Not all buyers will qualify. Higher rates apply for buyers with lower credit ratings. No-down-payment financing may be available for well-qualified buyers. Actual down payment may vary. Example for 2018 Civic: 0.9% for 36 months financing at $28.16 a month for every $1,000.00 financed. Dealers set actual prices. See your Honda dealer for details. 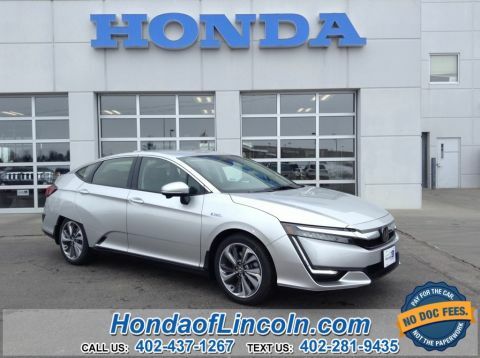 2018 Honda Clarity Plug-In Hybrid FWD I4 Beige w/Cloth Seat Trim, Alloy wheels, Automatic temperature control, Distance pacing cruise control: Adaptive Cruise Control with Low-Speed Follow, Exterior Parking Camera Rear, Fully automatic headlights, Heated front seats, Low tire pressure warning, Radio: 180-Watt AM/FM/HD/SiriusXM Audio System, Steering wheel mounted audio controls, Traction control. Discover the difference. Experience the value. Honda of Lincoln. 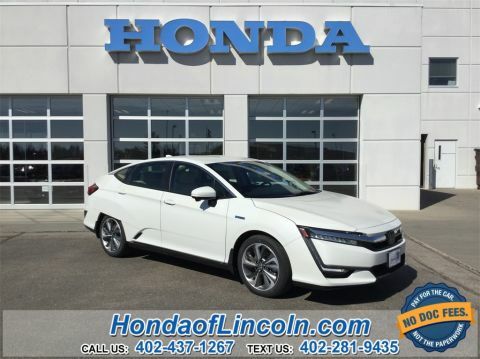 2018 Honda Clarity Plug-In Hybrid Touring FWD I4 Black w/Perforated Leather-Trimmed Seats, Alloy wheels, Automatic temperature control, Distance pacing cruise control: Adaptive Cruise Control with Low-Speed Follow, Exterior Parking Camera Rear, Fully automatic headlights, Heated front seats, Memory seat, Navigation System, Power driver seat, Power passenger seat, Radio: 180-Watt AM/FM/HD/SiriusXM Audio System, Steering wheel mounted audio controls. Discover the difference. Experience the value. Honda of Lincoln. 2018 Honda Clarity Plug-In Hybrid Touring FWD I4 Black w/Perforated Leather-Trimmed Seats, Automatic temperature control, Distance pacing cruise control: Adaptive Cruise Control with Low-Speed Follow, Exterior Parking Camera Rear, Fully automatic headlights, Heated front seats, Memory seat, Navigation System, Power driver seat, Power passenger seat, Radio: 180-Watt AM/FM/HD/SiriusXM Audio System, Steering wheel mounted audio controls. Discover the difference. Experience the value. Honda of Lincoln. 2018 Honda Clarity Plug-In Hybrid Touring FWD I4 Black w/Perforated Leather-Trimmed Seats, Alloy wheels, Automatic temperature control, Distance pacing cruise control: Adaptive Cruise Control with Low-Speed Follow, Exterior Parking Camera Rear, Fully automatic headlights, Garage door transmitter: HomeLink, Heated front seats, Memory seat, Navigation System, Power driver seat, Power passenger seat, Radio: 180-Watt AM/FM/HD/SiriusXM Audio System, Steering wheel mounted audio controls. Discover the difference. Experience the value. Honda of Lincoln. 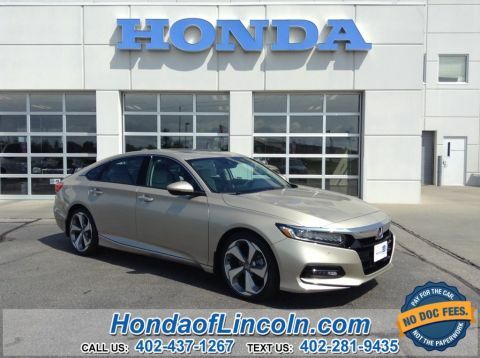 Honda of Lincoln is Lincoln’s premier Honda dealer and an 12 time winner of American Honda’s prestigious Presidents Award, most recently in 2017. We treat people with respect and integrity and strive to make the car-buying experience positive, pressure-free and enjoyable. Our goal is to exceed your expectations from test-drive to delivery, and we make every effort to make buyers feel at home while shopping with us, even if it’s online! Honda of Lincoln makes online car-buying easy with a top-notch interface that allows customers to search current used Chevrolet Impala inventory, evaluate trades, negotiate prices and submit quote requests. Honda of Lincoln is proud to be the largest dealer in our district, as we have been providing Nebraska residents with top-notch Honda sales and service for decades. 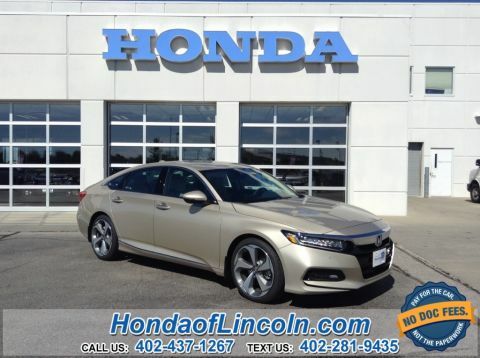 Whether you want to buy or lease a new Honda, used Honda, service the Honda you already own or discuss auto financing with our Honda finance team, our Honda dealership in Lincoln, NE, is here for you. Come to Honda of Lincoln to Discover the Difference. Our state-of-the-art facility includes a Honda model showroom, a selection of pre-owned Honda vehicles, used vehicles including used Chevrolet Impala, and an expansive service facility. We’re always accepting trade-ins to build up our used inventory, so don’t hesitate to contact us when it’s time for a new ride, too. With close to 50 service bays on site, we can handle any repairs or maintenance your vehicle may need. Additionally, our team of Honda finance experts are ready to discuss your financial options, ranging from new auto loans and leases to refinancing loans you already have. Visit Honda of Lincoln, today!